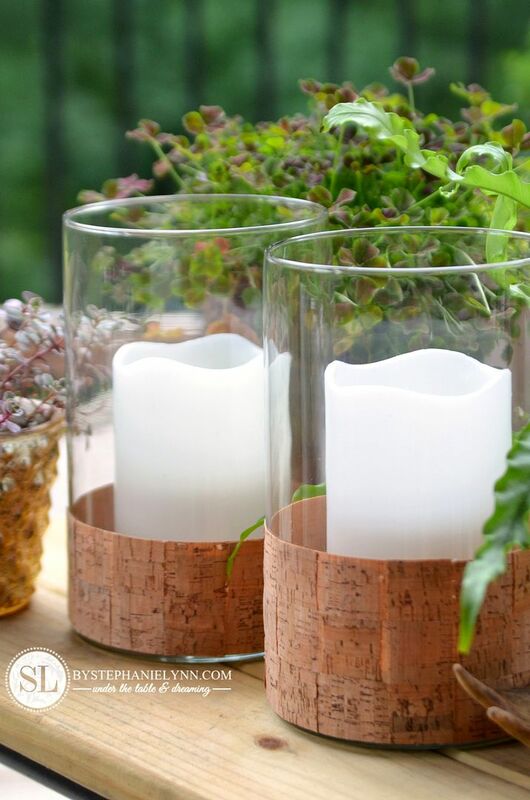 Cork Wrapped Candle Holders – natural glass hurricane centerpieces #michaelsmakers | I have a huge love for glass hurricanes. I pick them up every chance I get and I just can’t seem to collect enough of them. 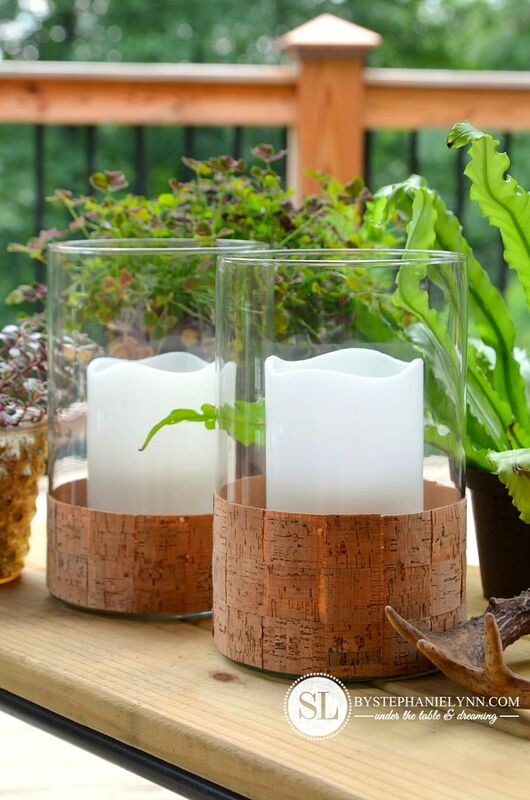 They are so versatile and perfect for adding a touch of candlelight anywhere, indoors or outdoors. 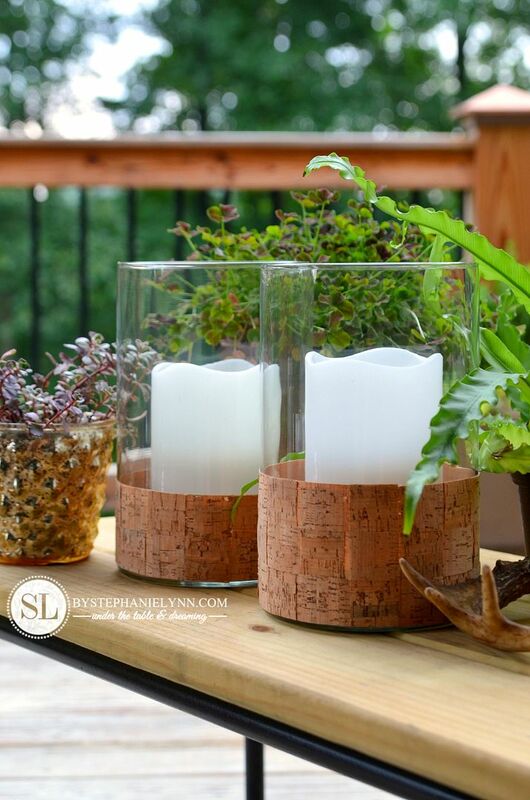 I am always looking for new ways to dress the glass up and today I have an incredibly easy update to share – that requires absolutely no crafting skills at all. 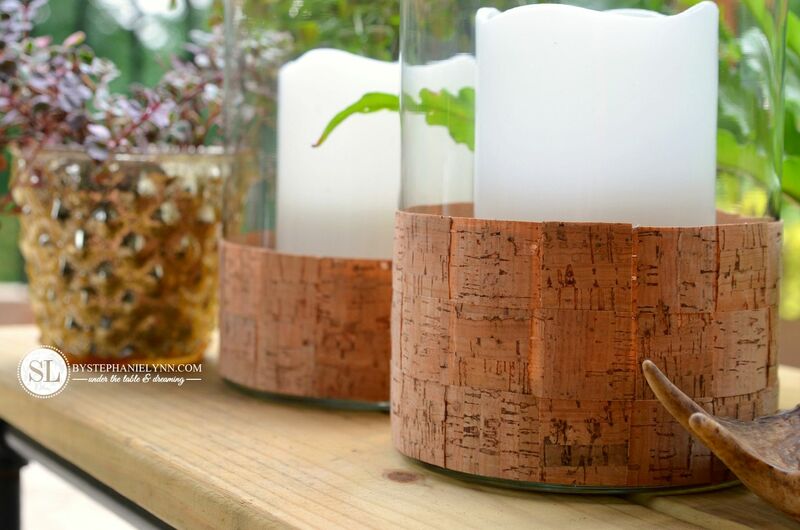 The idea for these cork wrapped candle holders was inspired by a new line of natural products from Michaels called Raw Bar. 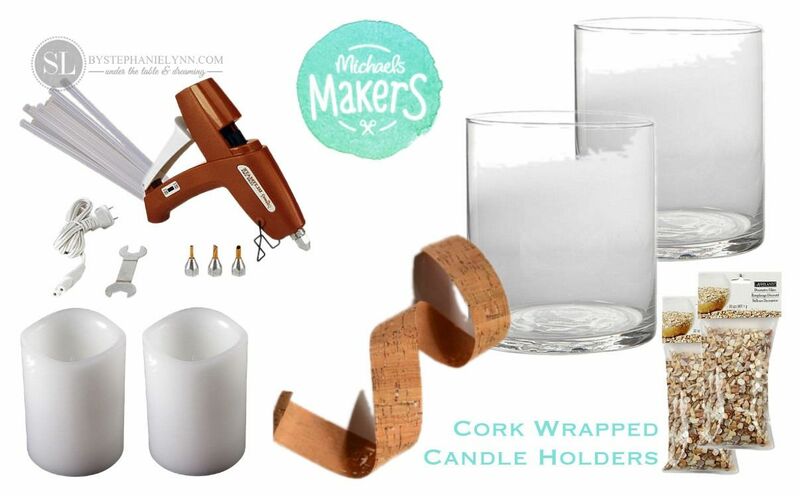 As a member of the Michaels Makers Blogging Team, a fun packaged arrived a couple of weeks ago giving us an exclusive sneak peek of the new products that will be arriving in stores August 8th. 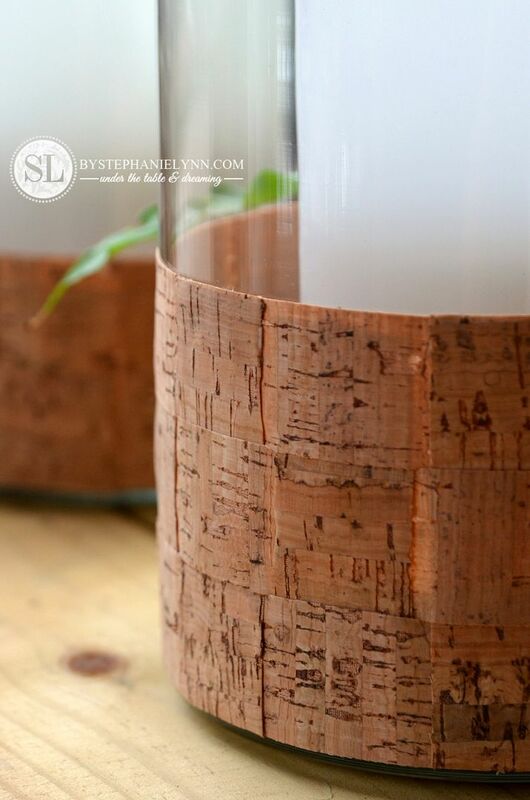 The line contains some of my favorite materials to work with – like wood, galvanized metal, chalkboard, canvas, burlap and cork. Our challenge this month was to utilize one these new products in a project. 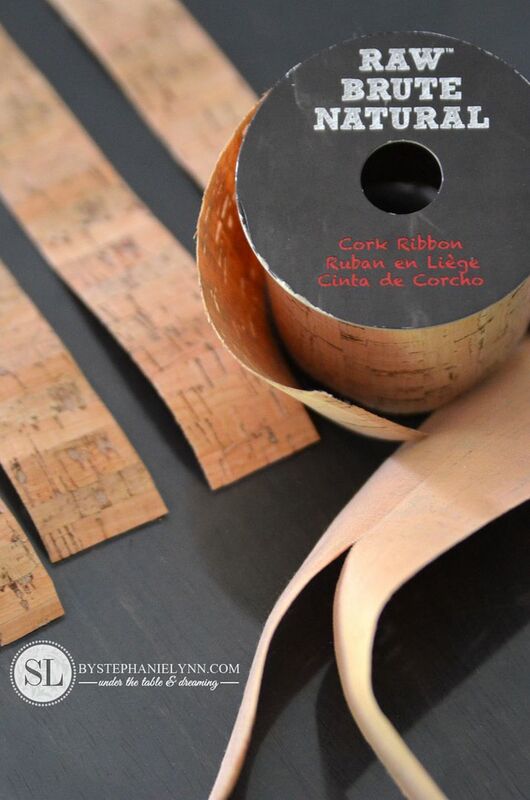 I fell in love with the cork ribbon – that is composed of a natural cork surface and a pliable ribbon backing. I took the opportunity to give a couple of plain glass hurricanes a quick and easy update. 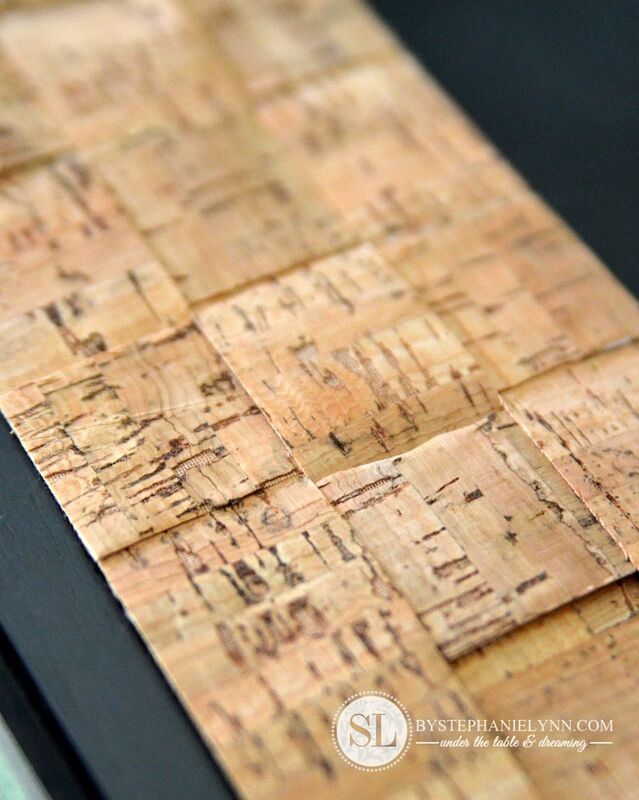 Step One: Unroll the cork ribbon and cut to size. The ribbon is approximately 2 1/2 inches wide. 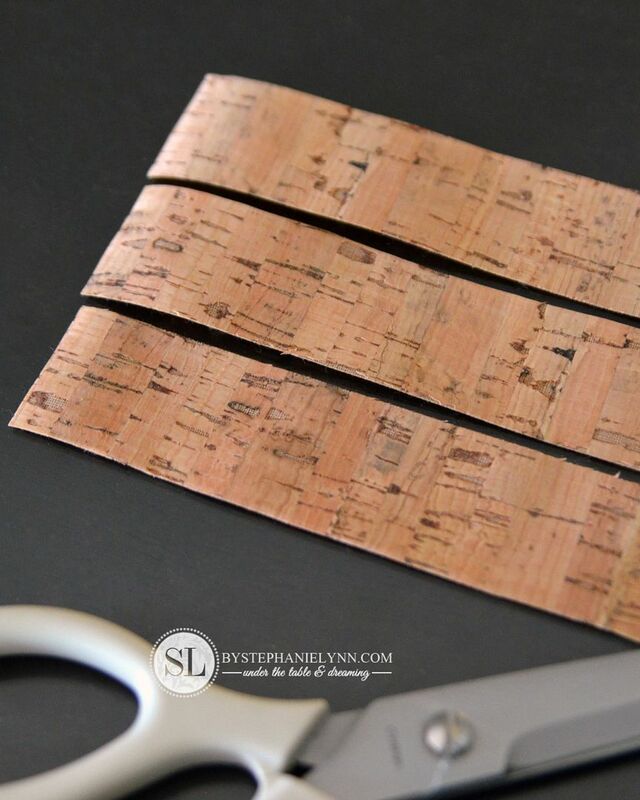 The ribbon was first cut in half – as shown above – leaving skinnier ( 1 1/4 inch wide) pieces to create the weave pattern. Three pieces of the ribbon were then cut long enough to go around the entire circumference of the glass vase. 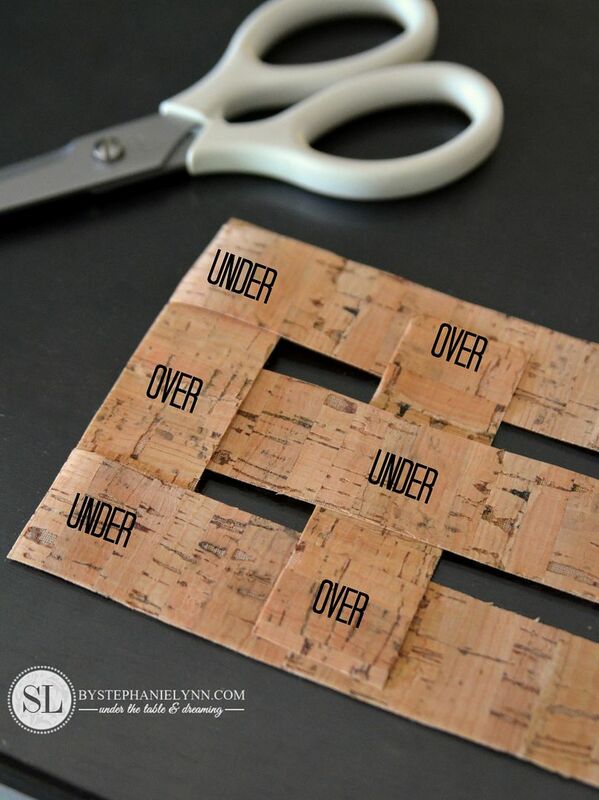 Smaller pieces of the ribbon were then cut – as shown above – to create the weave pattern. Step Two: Lay out the ribbon pieces, creating the weave pattern. Each small strip of ribbon will be weaved into the longer strips, alternating the pattern shown above. 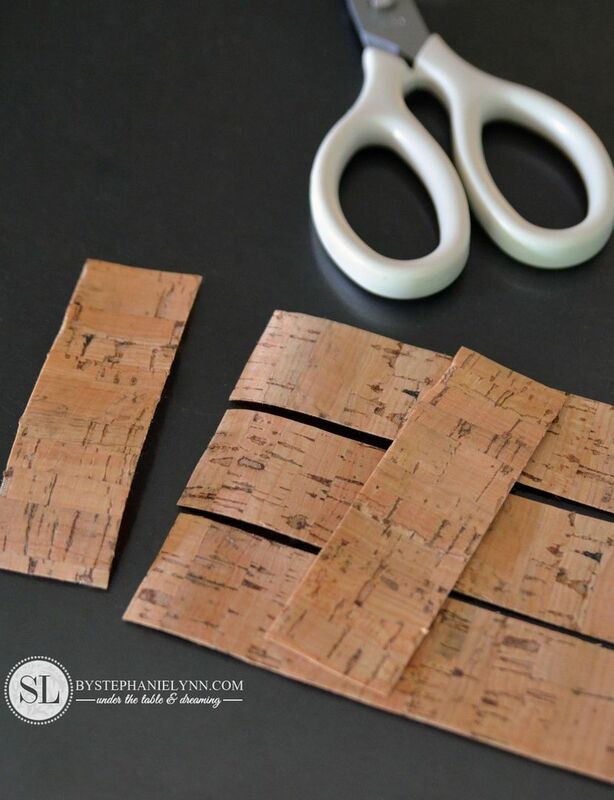 Step Three: Use a hot glue gun to secure the strips in place. 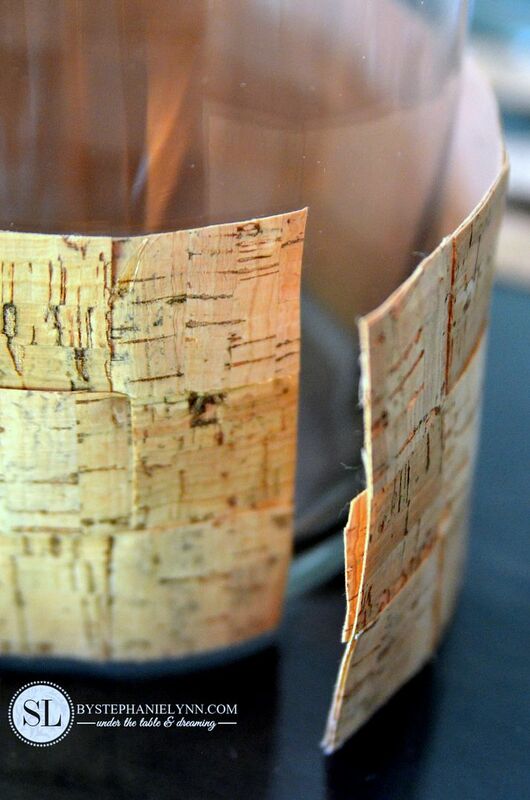 Step Four: Attach the weaved cork ribbon piece to the glass vase using a small amount of hot glue. 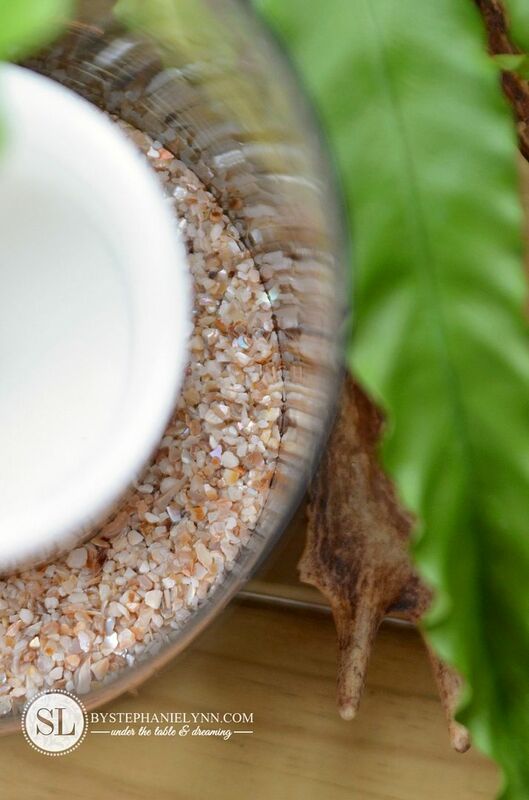 Simple, quick and easy – with a natural, neutral look I just adore. The crushed shells were used as a filler and made a nice bed to nestle the candles in place. 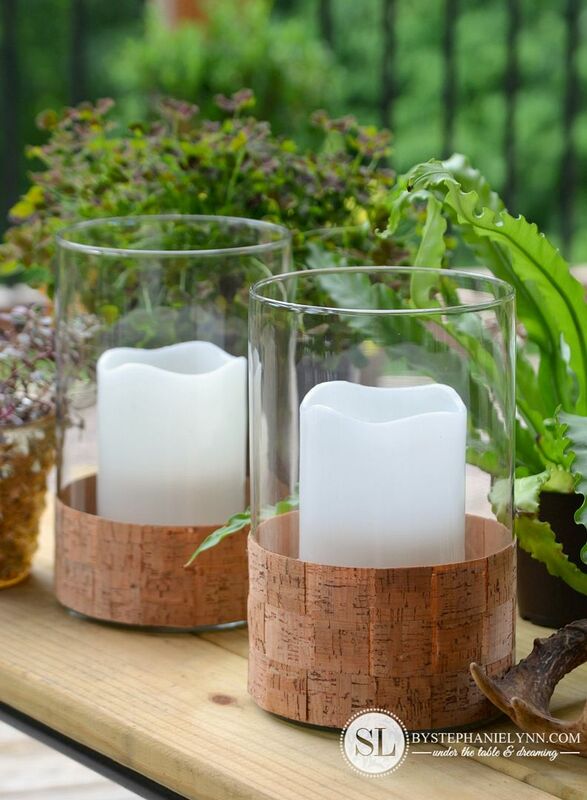 The led candles are a favorite as well. I love the realistic look and the fact that they can be used over and over. Plus they are worry free if you have little ones. 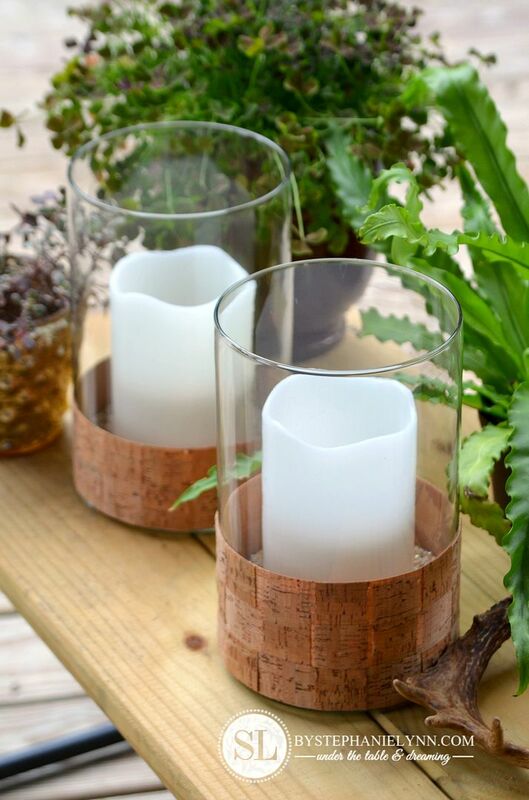 The hot glue works extremely well on the glass – holding everything in place. I have used it many times without any problems and the best part is when you’re ready for a change it easily peels right off. 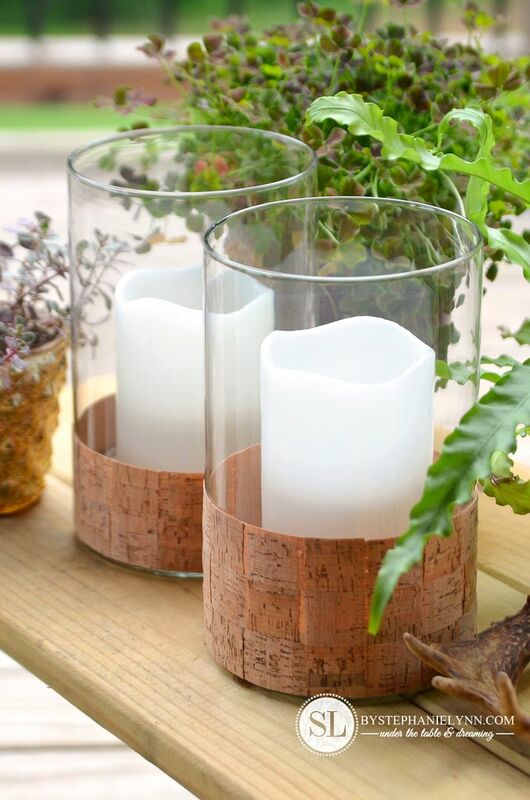 One roll of the cork ribbon was just enough to cover both vases – however if you look at the photo above you can see one vase is three strips high and the other is two strips high – since we were working with limited preview supplies. I’m pretty excited to see this full line arrive in store. For more inspiration check out the rest of the projects for this months challenge below – enjoy. This post is brought to you by Michaels . The opinions read here are entirely my own. Michaels now has online shopping offering Free Shipping on orders over $50 or free in store delivery. I saw (and bought) this ribbon at Michaels for the first time Sat, Sept 20, 2014. 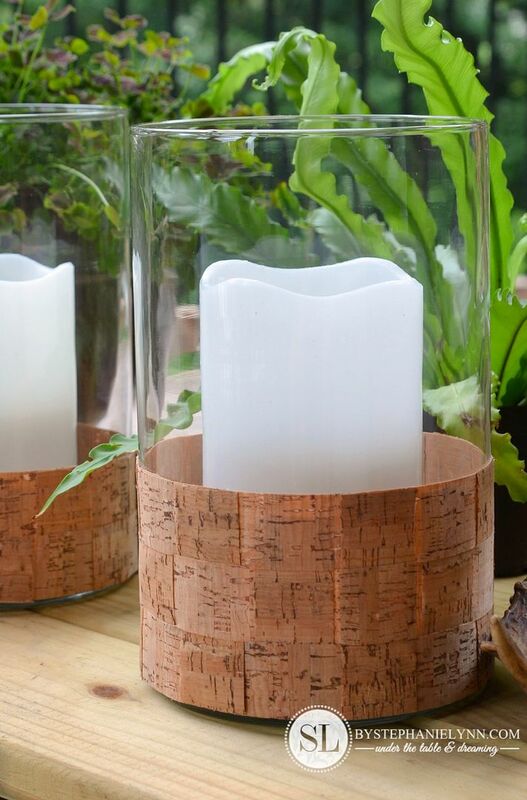 My FIRST thought was to do just what you’ve done: wrap a clear glass cylinder vase in cork and insert a candle; then add any other embellishments as desired.